Reviewed by Tiggerito on Sep 20, 2010. Several days later, almost every page is dog eared and full of scribbled notes. I finished it quick time, and am ready to go through it again. I will have to keep going back to it again and again so I can soak up more of the information it distils! 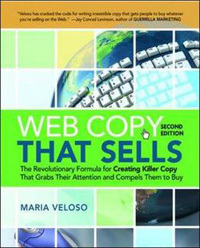 The cover states it as "The Revolutionary Formula for Creating Killer Copy That Grabs Their Attention and Compels Them to Buy". To wit, The book contains over 300 pages packed with copy writing advice specifically to sell products online. The sort of copy me and my clients (small businesses) need. I believe beginners (like me) are pushed in the right direction by this book. After reading it we should have a style of copy which is far more focused on encouraging visitors to become customers. The professional copywriter will be able to grasp the more advanced concepts it details, like the "Trifecta Neuro-Affective Principal" . One day I will use that in a conversation! My biggest problem is that there is too much information to take in! That is why, as I write more copy, I will be periodically going back through it to refine my skills.